The McCune Mansion is a haunted place in Salt Lake City, Utah that is quite popular among both the residents of the city as well as the tourists who visit this spectacular city. This awesome structure sits on a hill that is located near the down town area of the city. This structure has a long history which has everything to do with the hauntings that occur in the home. 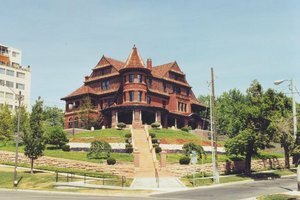 If you want to experience a haunted place, and you will be in the Salt Lake City area, the McCune Mansion may prove to be a point of interest to you. In the year of 1900, a successful entrepreneur by the name of Alfred W. McCune and his true love and wife, Elizabeth, opted to construct a mansion that would roughly cost approximately half a million dollars. It was to be constructed on a hill that overlooked many points of interest. On one side, an individual could look over the town, and if someone were to look out from the other side, they could observe the beautifully constructed Mormon Temple. The home was constructed in a style that was often referred to as “Bungalow”. In the year of 1901, the McCune family officially moved into the home. Once the couple’s children grew into adults, they decided to move to Los Angeles and gave the beautiful mansion to the Mormon Church. This took place nineteen years later, in the year of 1920. Today, it serves many purposes, including a home for the spiritually lost. •	One of the first hauntings that seem to occur in this particular location is that of a male spirit. It is said that this spirit often shows himself to individuals in the structure when they are alone. He is a tall man, which is most often said to be wearing a cape that is black in color. He seems to be a friendly spirit that simply observes, but he does startle the individuals whom he comes in contact with…. •	There is apparently a spirit present that is of a young girl. She appears to be right around the age of ten. It is unknown who this child is, but many individuals believe that it is the same child pictured in a wall hanging in the home. She often is seen near a mirror on the West side of the immense structure. Many who have experienced this child say that she actually walks right into the mirror to not be seen again, and that she is wearing a gown….